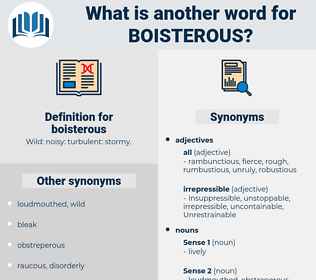 What is another word for boisterous? restrained, silent, solemn, moderate, calm, soft, subdued, quiet, low. 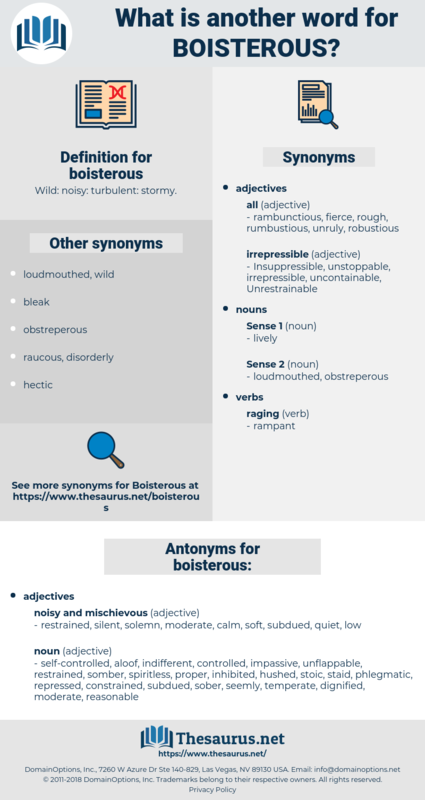 orderly, reasonable, hushed, indifferent, seemly, aloof, controlled, stoic, noiseless, decorous, spiritless, proper, self-controlled, sober, stolid, phlegmatic, detached, somber, depressed, staid, repressed, unflappable, inhibited, constrained, impassive, dignified, temperate. He really was, for him, ridiculously amiable, though his amiability, like everything else about him, was rough, almost boisterous. The boisterous fun of an hour ago had all faded out, leaving him dissatisfied and lonesome.